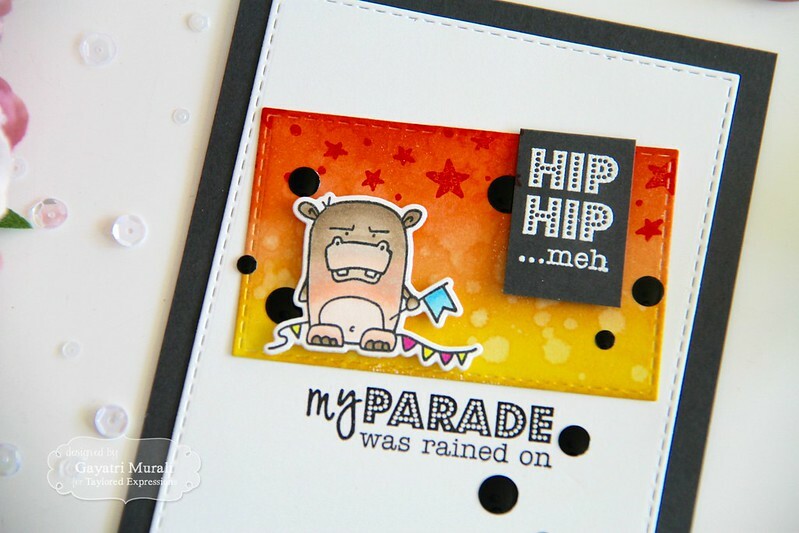 A quick post sharing a Grouchy Grumpling card using the new Grouchy Grumplings 2 stamp set from Taylored Expressions. I coloured the hippo from Grouchy Grumplings 2 stamp set using copic markers and die cut the image using the coordinating die. For the background I sponged the background stitched rectangle panel with distress inks Ripe Persimmon, Fossilized Amber and Candied Apple. I stamped the star background from Matchy Backgrounds stamp set using Candied Apple distress ink. The image is adhered using foam adhesive on the left side of the panel. One sentiment is heat embossed on Poppy Seed strip of cardstock and the second sentiment is black heat embossed below the focal panel. The card is embellished with Oreo enamel shapes from Taylored Expressions. Here is a closeup of the card. All the supplies used to make this card are listed below for you. All the new release products are available for purchase from Taylored Expressions store.